This PGS A30 Cast Aluminum Grill features durable and permanent cast aluminum housing and a 30,000 BTU stainless steel dual-control H-shaped burner. The Sure Start electronic ignition ensures that lighting your grill is a quick, safe, and easy process. The 1/4 inch stainless steel rod cooking grids, ceramic Moon Roks, and porcelain coated steel Moon Rok tray deliver even heat distribution across 330 square inches of main cooking area. The 121 square inch warming rack provide additional cooking area. 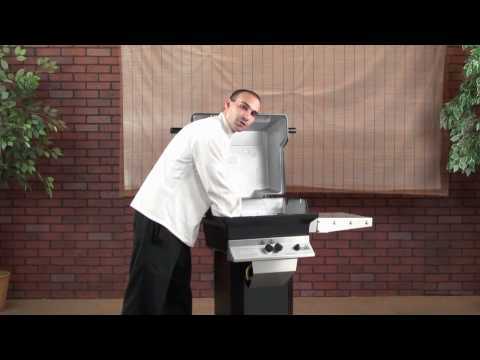 This A30 gas grill also includes one stainless steel side shelf and a 48-inch black in-ground post. Natural gas hose included. Cooking Grid Dimensions 20 5/8 X 16"
PGS warrants the stainless steel cooking grids, warming rack, and upper and lower housings are free will be free from defects in material and workmanship for a lifetime. The stainless steel cart, stainless steel side shelves, Flare Guard radiant shields, and brass valve assembly are warranted for a period of ten (10) years from the original date of purchase. The stainless steel burner assembly are warranted for a period of five (5) years and the electronic Sure Start ignitor, all galvanized steel components and all other parts are warranted for a period of one (1) year from the original date of purchase. PGS grills also offer a ninety (90) day warranty when used in a non-residential, commercial, apartment or condo common areas. 20 5/8 X 16" 24 X 15 3/4" 24 X 17" 24 X 15 3/4"